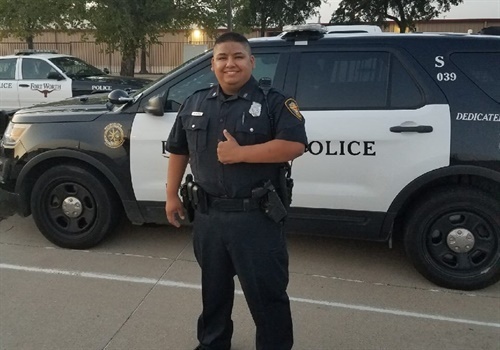 The Fort Worth (TX) Police Department announced on its Facebook page that Officer Xavier Serrano — who was shot while responding to a call of shots fired two years ago — has returned to duty. Image courtesy of DPD / Facebook. The Fort Worth (TX) Police Department announced on its Facebook page that Officer Xavier Serrano — who was shot while responding to a call of shots fired two years ago — has returned to duty. During the 2016 incident, officers had discovered 81-year-old Carl Fleece dead with a gunshot wound to the head. Witnesses told officers that the shooter had fled to a shed in the yard. As officers opened the doors to the shed, Fleece's son, Martin Fleece, fired at them, according to the Dallas Morning News. The department noted in its post that Serrano is "now back in patrol, serving and protecting the great residents of Fort Worth!" The agency added, "We are proud of Officer Serrano's resilience. We are proud of his commitment to serving and protecting his community."